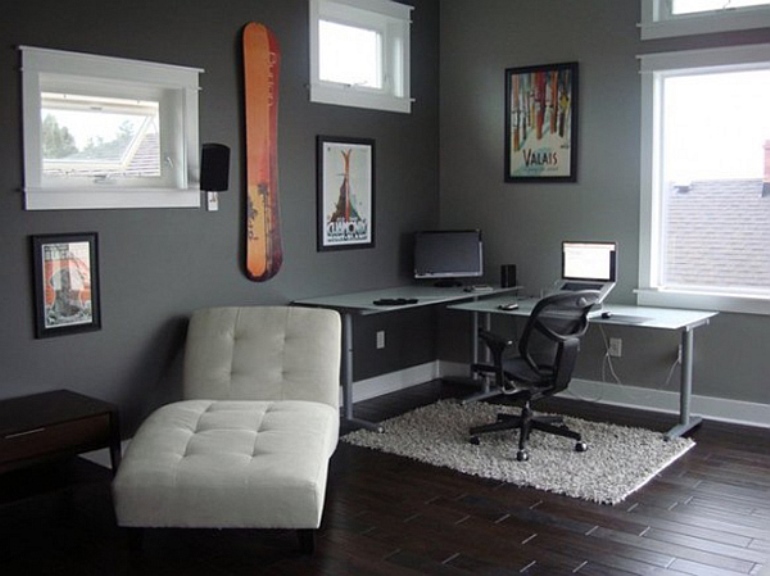 The study is a place for concentration, creativity and focus, but if the room is cluttered, dark and dreary, you may find it difficult to get the task in hand done. We gave you some advice on creating the perfect ambience for your study in our recent infographic. In this article, we will look at some study’s doing it right. Working near windows, bathed in natural light can aid concentration as we feel more alert. If you’re working in poor lighting conditions, your cortisol levels drop significantly, which can increase stress levels. Light is definitely your friend in the study. The above study looks like a blissful place to work. 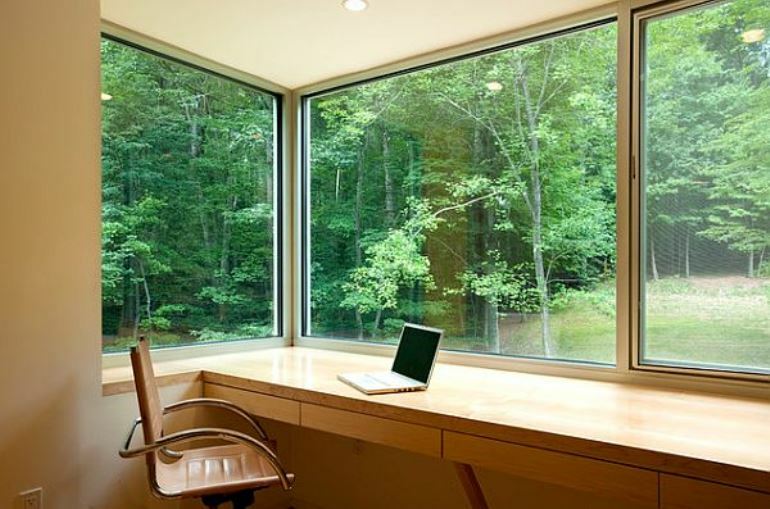 Masses of natural light, a stunning view and a clear desk. I can picture Stephen King sitting here, writing his next thriller. 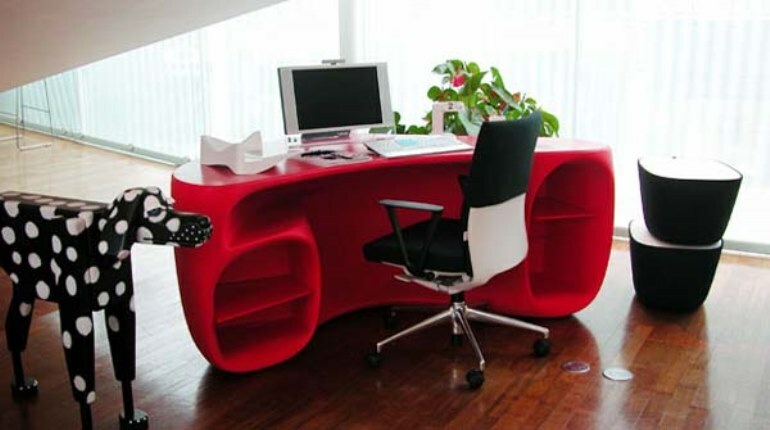 Below, we have a very sophisticated study complete with a desk area and a curved sofa for pondering your next great idea and giving your eyes a break from the screen. Again, with three windows, this would be an ideal place to work. It is believed that by having red ornaments, decorations or accessories, it helps you concentrate with work that involves close attention to detail. If you are in a more creative role, blue is the colour to enhance your creativity, so decorate your study with this colour in mind. Above are some red (maybe slightly pink) and blue office accessories from Urban Girl to help you work from home. A moderate level (70dB) of ambient sound enhances performance on creative tasks. Why? The slight difficulty in information processing promotes abstract thinking. Next time you are struggling for ideas or inspiration, whack on the radio and let those creative juices flow.